The Phi Phi Omega Chapter of Alpha Kappa Alpha Sorority, Inc. was established in 2001 and is committed to community service and the development of youth in North Fulton, Georgia. In addition to engaging in mentoring, and sponsoring programs for advancement of education, health, and economic empowerment, we assist in promoting talented young women in pursuit of higher education. 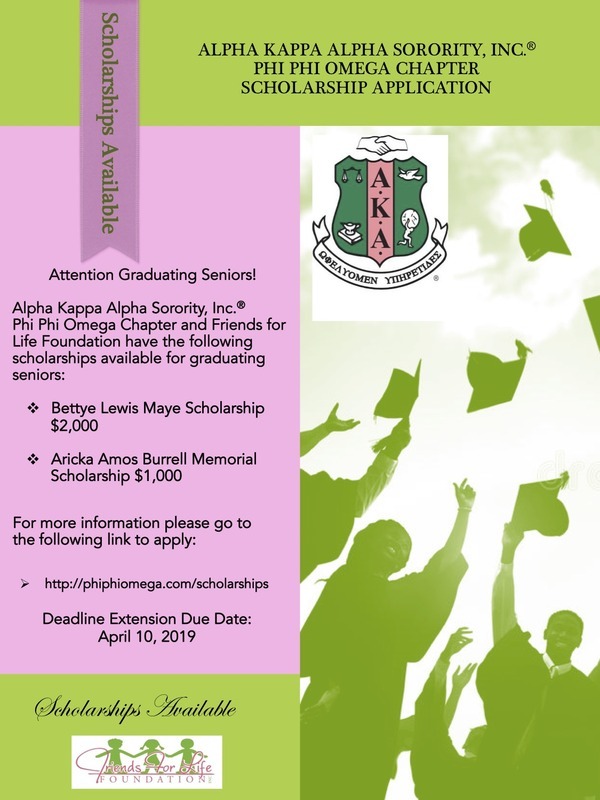 Through gifts and donations provided by community partners and members of Phi Phi Omega, we are pleased to announce the availability of the Bettye Lewis Maye Scholarship and Aricka Amos Burrell Scholarship in 2019. As the organizing President, Mrs. Maye was the impetus behind the Alpha Pearls Cotillion, our signature rite-of-passage event for African American high school juniors and seniors. The cotillion continues to be an event of significance throughout the metropolitan Atlanta area, whereby scholarships are provided to many of the participants. In 2006, Phi Phi Omega unanimously agreed to name one of the scholarships, being awarded to a high school senior, the Bettye Lewis Maye Scholarship. Click here to view the application. The deadline has been extended to April 10, 2019. For additional scholarship opportunities, please visit our Friends for Life Foundation Scholarship Page.